Trimming and pruning are important to encourage the growth of strong, healthy trees. But these measures can also harm your trees if they’re done incorrectly. Established tree trimming standards must be followed. Over-trimming, cutting trees at the wrong time of year, trimming branches too close to the trunk, and altering a tree’s drip line (the outer edges of the tree’s branches) can harm a tree’s health and appearance. Seasonal tree trimming for some species, such as Crape Myrtles, requires expertise to maximize shape and blooming results. In some cases, it may be necessary to trim a tree to remove dead branches or fallen limbs on houses, or to balance a leaning tree. Other times, you may need to go beyond basic tree trimming and remove entire trees on an emergency basis. Whatever the case, we can handle all of your tree trimming needs. 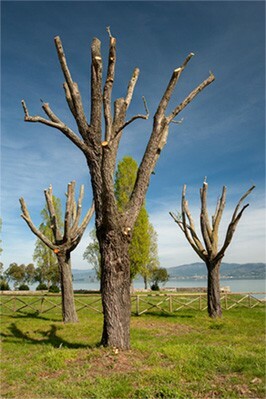 Of course, it’s always best to take care of toppling, damaged or dying trees before they turn into emergency situations. Don’t wait for a severe storm to identify dangerous trees. Give us a call and we’ll identify any problems that need to be addressed. We’ll provide you with a FREE estimate for tree trimming anywhere in Atlanta. Why Hire a Professional to Trim Your Trees? Sure, trimming a tree may seem like a simple task, but don’t break out your saw yet. The truth is, it’s not nearly as easy as many people might think. In general, it’s always best to hire a professional tree trimmer to do the job. That’s because the professionals have the specialized equipment and knowledge to do the job correctly. 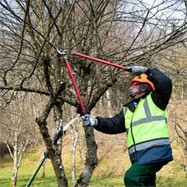 It is important to prune a tree at the right time of year, and a pro knows when that is. Our ISA Certified Arborists take into consideration the time of year a tree flowers or is most susceptible to disease and insects. Proper pruning is essential for a healthy and aesthetically-pleasing tree; to help spur growth in foliage, fruit and flowers; and to remove diseased and damaged areas. A professional will have the expertise to properly prune a tree, whereas the homeowner might not. The pro also knows how to use pruning to develop a proper shape in a tree when it is first planted, enhance the natural form of a tree as it matures, help a wounded tree heal properly, and prevent hazardous situations from developing. Dead or dying branches and diseased or insect-infested limbs may need to be removed to prevent injuries and damage to property. If you need shrub or tree pruning, give us a call at 770-912-4033 and we’ll provide you with a FREE estimate. Many types of ornamental trees and flowering trees need annual pruning, and most have a specific time period when this should be done. 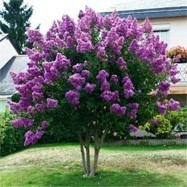 In Atlanta, this is especially true for Crape Myrtles. They should be pruned sometime between early February to early April. This way the trees can be trimmed before new growth and blooming starts. If you need help with seasonal pruning and you live in the Atlanta area, we can help. We realize the pruning process can be difficult, and you may not have time in your busy schedule to prune your trees when they need it. When you enlist our services, you can feel confident knowing we’ll get the job done promptly, and we will prune your trees in a manner that preserves their long-term beauty and health. Removing dead and broken limbs is also important. Trees need to be trimmed to improve their health and to prevent falling limbs. Dead trees and branches are unpredictable and can break and fall at any time. Pine trees are very prone to having large diameter, heavy limbs that die. These limbs often break off, get hung up on other limbs and randomly crash down during high winds. Sometimes these limbs damage roofs, hit people or pets, or fall down on power lines. Removing broken and dead branches and limbs—before they fall and hit something—is essential to prevent accidents. If you see dead or dying branches or limbs on your trees, give us a call. Our professionals can trim your dead wood, inspect for damage or diseases, and haul any fallen limbs from your property. We offer very competitive prices for tree trimming services. Of course, every job has its own challenges and requirements so prices do vary. Because of the costs of our equipment, fuel and travel time (which we must pay our crews), we do have a minimum trip charge of $300. The size of the job determines the total tree trimming price. A residential tree trimming project may be only 2 to 3 hours of work, whereas a large commercial property may require 1 to 3 full days of work. Obviously the price for the two jobs will vary considerably. 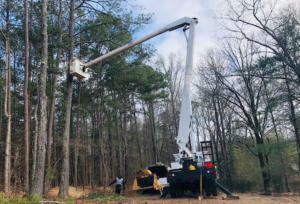 Anytime we come out to your house to trim your shrubs and trees, when we are done we’ll grind the limbs in our wood chipper and haul away the wood chips. 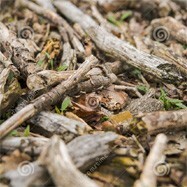 If you prefer, you can keep the wood chips to use as landscape mulch. Call Today 770-912-4033 or fill out our contact form.